The Project of Love-The Butterfly Project has had an incredible first half of 2016! We have been blessed to start several new businesses and expand the Mercy Elderly Home for Widows. POL – The Butterfly Project was just a dream two years ago..today it is a reality serving many in Uganda. POL has been so blessed to help Amahoro Children’s Home, Home of Hope and Dreams, we started Mercy Elderly Home, The Cristine and Millie Project, and The Butterfly Project –our small business development project. The beginning of 2016 brought some turbulent times in Uganda. The National Presidential and Parliamentary Elections were scheduled for the second week of February. It was a highly contested election. The President was up for re election as were a large number of members of Parliament. The Internet and Phone service was disturbed or shut down numerous times from January through the elections in February. The citizens were frightened, violence was anticipated throughout the country. Businesses suffered a substantial decrease in traffic and thus revenue. The sitting President was reelected and Parliament was seated without incident. God had gone before and prepared the way for their Government to continue peacefully. Shortly after President Museveni was re-elected he declared for the next 5 years that Ugandans were free to openly worship God! The forces of evil were at least quieted for a time, the citizens have been striving to get back to living their normal lives. The unemployment rate in Uganda is over 80% nationwide. The few jobs that come available are given quickly to someone already acquainted with the employer. The Butterfly project had started two small businesses in 2015, the Piggery for Sammy and a driving service for David Kamanzi. It was struggling but still viable. Sammy has since chosen to be a Pastor at a church in Kampala. His father is still running the Piggery. David was having success with his new business. He is the director of Home of Hope and Dreams and uses his car business to develop income to meet daily needs of the children. It was time to start new businesses…BBYF was the next to be funded. They have a very successful shop that sells electronics, phones, computer supplies, Christian DVD’s and music. They are now repairing cell phones. Three boys have been trained to repair phones. One boy was lost and now is saved. He was homeless and now pys his own rent. The profit from BBYF goes to fund their youth ministry. The next several months saw numerous new business startups. Dorah’s Beauty Salon in Matuga, Jackie’s Chickens in Entebbe, Millie’s small family grocery in Entebbe, Miria’s Fancy Shoes in the shoe district of Kampala, Adi’s Electrical Repair and Supplies in Matuga, Moureen’s G-Nuts and Juices in Bombo and Nelly’s Transport Service in Bombo. As of July 31 we have 10 successfully started Butterfly Businesses. David Paris and Gary Shotton traveled to Uganda the first two weeks of July. They worked individually with each of our Butterflies on their business plans, monthly financial paperwork and encouraging ideas to grow their business. Gary and David presented another addition of “How to Write your Business Plan” to a group of Ugandan Army wives, and an open class for over 30 who have started or wish to start a new business. In March 2016 we hired Nelly Nsereko to oversee The Butterfly Project and to help with Project of Love in Uganda as our Ugandan Representative. He has been essential to our ability to develop these businesses and programs. He helps us with cultural hurdles, language barriers, financial challenges and organizational needs. Elderly Mercy Home is growing and developing each month. We have had several widows who have gone home to meet Jesus this year. Our widows are between 80 and 105. We have been blessed to provide them a comfortable place to live, medical care as needed and love and acceptance they never imagined. We have a young mom and her new baby living at EMH. The widows are sharing with her how to be a mother, how to care for herself and her baby. Lovingly, the widows have taken them under their care sharing their many years of wisdom and family devotion. Both mom and baby are thriving because of these precious widows. We are challenged with paying their rent again this December. In Uganda rent has to be paid in advance for a 12 month period. Our annual rent for the home is $2500 dollars. We also provide funding for utilities, food and medical care. We have several widows who are still able to live in their homes, we provide a minimum of $50 USD for their monthly needs. We have been able to get kerosene, food, water, medicine and clothing each month for these amazing ladies. We have purchased two sheep for Christine and Millie. They are not yard animals, they are domestic house guests…sleeping with them in their huts! We are anticipating the remainder of 2016 will be filled with miracles we could only imagine. 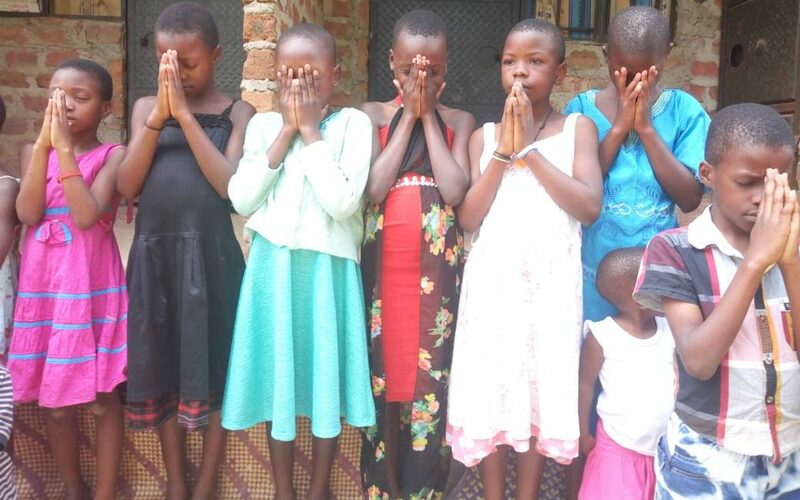 We give ALL of the glory and the honor to God our Heavenly Father for allowing us to share His love and abundance with our brothers and sisters in Uganda. We are all family…brothers, sisters, aunts, uncles, grandmothers, Jajja’s, grandfathers and siblings…we may live half a world apart and have different skin tones but God made us alike in that we all have given our hearts and our lives to HIM!